Advance copies of Print Media Productions hardcover edition of Mirabilis: Year of Wonders - Winter Book 1 are now on sale exclusively from First Age Comics, Lancaster. A huge graphic novel project by Dave Morris and Leo Hartas, Mirabilis is a fantasy adventure story for young adults which opens New Year’s Day 1901, when a green comet appears in the sky. As it gets bigger, the line between reality and fantasy blurs. Soon there are mermaids in the Thames, elves in Parliament and a dragon roosting on Big Ben. But then the comet rounds the sun and starts to fade. Will the world be able to go back to a life without magic? "We couldn't be more pleased with the production design on these books," says Dave Morris. "Typography, colours and layouts all add to the reading experience, and Print Media have carried all that through with professionalism and a real eye for detail. "The end result is not simply our comic between hard covers, but a beautiful work that we think readers will treasure." 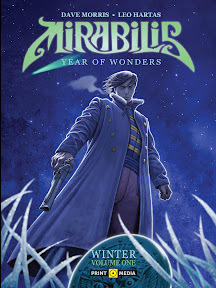 Mirabilis: Year of Wonders Volume 1 was solicited by Diamond (Order Code FEB111949), joining Keith Page and Stephen Walsh's Iron Moon title as the first graphic album projects from the new British company. Both albums will be re-solicited in July Previews. X-Men First Class, which was mostly shot in the UK, arrives in cinemas here next week (1st June) and here's a trailer for the film, courtesy of the distributors. Set in the 1960s and focusing on the relationship between Professor X and Magneto and the origin of their groups, the X-Men and the Brotherhood of Mutants, the film stars James McAvoy as Professor X and Michael Fassbender as Magneto. Other cast members include Kevin Bacon, January Jones, Rose Byrne, Jennifer Lawrence, Zoë Kravitz, and Lucas Till. The film is directed by Matthew Vaughn (who also directed the film adaptation of Neil Gaiman's Stardust in 2007) and the screenplay's writer credits include Jane Goldman, who is partner to comics writer and TV presenter Jonathan Ross. Other British connections for the film include its official single, 'Love Love', by Take That, released via Polydor Records. (Stardust which featured Take That’s massive hit 'Rule The World', one of the biggest-selling singles of the year). Twentieth Century Fox envision this film as the first in a new trilogy to reboot X-Men on the big screen. Don’t be a mug – obey the law! A top-quality mug lovingly wrapped in classic Judge Dredd artwork from one of the greats of 2000 AD – the latest merchandise from The House of Tharg is perfect for sitting back and sipping your synthi-caff! This limited edition Mega-City One Justice Department-approved beverage holder features the stunning wraparound cover from Prog 169 in 1980, drawn by legendary Judge Dredd artist Mick McMahon. It shows Dredd leading a charge of Mega City forces in one of the most iconic images from the early years of 2000 AD. 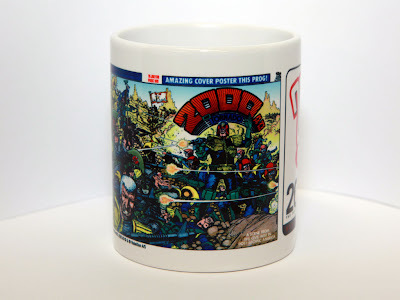 Exclusive to the 2000 AD online shop for just £7.99, this new mug joins a host of 2000 AD merchandise from t-shirts and action figures to badges and sketch books. 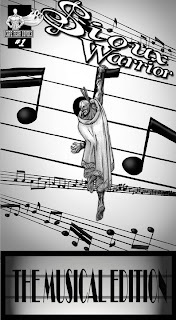 Continuing radio show Panel Borders month of shows about the crossover between music and comics, Alex Fitch talks to the creators of a couple of small press publications which feature music in their stories and contain a soundtrack to listen to while you read the comic. 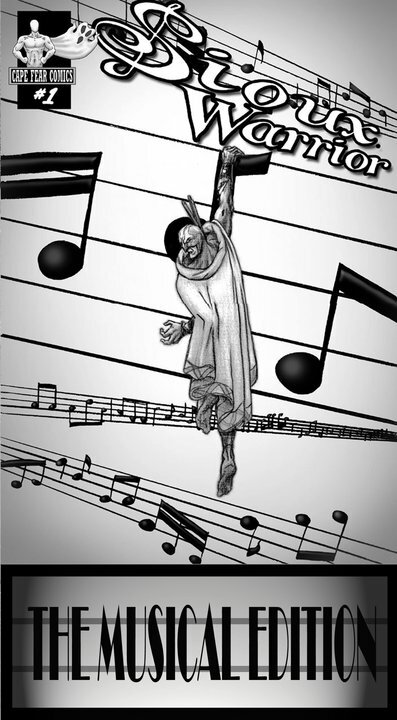 Writer Sam Gardner and contributing artist Lee O’Connor talk about Sioux Warrior, a new comic about a mysterious hero who is one part Sitting Bull and one part Phantom of the Opera and while enjoying his adventures, the reader is also serenaded by a sound chip built into the publication itself. The Phoenix Comic - the new weekly comic springing from the ashes of The DFC - has just updated its website and also published its submission guidelines, which we're running here in full. Launching in January 2012, the team say the 32-page comic will offer both humour and adventure strips, along with features and puzzles. The Phoenix Comic is looking for strips with heart – stories that are open and engaging, whether they are told across three panels, three pages, or episodically over several months. "We’re always open for new submissions of self-contained (ie conclusive within one issue) and episodic strips. "Right now we’re particularly interested in receiving pitches for stand-alone (conclusive within one issue) stories of 4pp in length. "We’re also keen to hear from puzzle-makers with experience in producing challenging and fun puzzle content for 8-11 year olds, and artists with experience of providing occasional illustrations for text content. When it come to what they're not looking for, the Phoennix will not be publishing material for very young children, or teenagers, or adults, or strips bulging with counter-culture angst. "We won’t be a good home for you. Sorry! And at present we are not accepting material from authors with a script but no illustrator on board." a brief outline of the concept and, if not stand-alone, short detail on the proposed story arc and intended number of episodes. style sheets showing key characters, a sample page layout and indication of finished colour work. Tech info: detail on paper finish TBC but please assume a sheet-size of 211×297 (A4). You can email your submission to: submissionsATthephoenixcomic.co.uk or send by post to: The Phoenix Comic, 29 Beaumont Street, Oxford, OX33 1AL (please enclose an SAE if you would like your material returned). The Phoenix crew point out "we are a very small editorial team and look closely at every single submission. Sometimes this can take a little time. "We will get to your material as fast as we can, but you may have to wait up to six weeks for a response (sorry). "If we think your submission has potential we’ll contact you to arrange a meeting to discuss the material in more depth. "If your submission isn’t right for us we will let you know the core reasons for rejection. And, in that event, please don’t give up hope – there are many other potential homes for great content out in the world and in many instances we will be saying no simply because of space limitations. We have to make tough choices, and of course there is a degree of subjectivity involved too. Unfortunately time constraints prevent us from engaging in extended correspondence on rejected submissions." Will you help bring back Captain Clevedon? Comics artist and writer Kev F Sutherland, whose credits include The Beano, Doctor Who Adventures, Match and others, is looking for an artist, or artists, to help him finish a comic that's been lying dormant for a number of years. Kev's a dedicated comics creator who I've worked with in the past on Doctor Who Magazine and has done much to promote comics to people, through the original Bristol Comic Festival, his Comics Masterclasses in schools across the country and TV appearances. "In 1994 I wrote and drew an eight-page photocopied comic called Captain Clevedon, he explains via his blog. "He's a superhero based in the town where I live, and it's a comedy action strip intended for a wide audience, from kids to adults. "Its initial run sold out in the town itself back in the day, and even got featured on local TV (cheesy, ain't it?) but I never progressed with it after that first taster issue. "It's always been a popular character that people bring up in conversation," he continues, "and lots would like to see his story finished, but I can never quite find the time. Added to which my comic art style has crystallised as much more cartoony than I think suits this book. "So, I'm looking for a superhero artist to help me complete it. 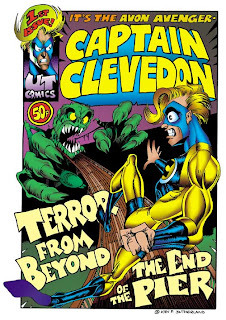 I have the script plotted and almost complete for a 24 page self-contained first story (In which Captain Clevedon learns more about his powers of Enhanced Benevolence and defeats the Severn Boar/stroke/Sky Pig From Space). Who'd like to draw it? "The caveat is that this is, most likely, not a money-making venture. I wrote and drew the original for love (and the vast profit from its sellout first run, which added up to less than fifty quid, spread over more than a year) and would expect this issue to not make big money. However I would offer any collaborators an agreed profit-share, in the event of the comic taking off, and would split all sales pro rata (eg Comic Convention sales, Indy Planet online sales, plus you could get cost price copies via Ka-Blam to sell yourself). This project is ideally suited to an up-and-coming artist who wants to use their pages to boost their portfolio of superhero art. And, by the way, the end product will be fun to read. And when they option it to make a movie we'll all get to go to a party (that last bit is not guaranteed, by the way)." If you're intrigued, check out the original short story from 1994 on his blog here. "The new 24-pager will not be in the same cramped comedy style with four bubbles to a panel, six panels to a page," Kev insists, "but will be in a more familiar superhero comic layout. 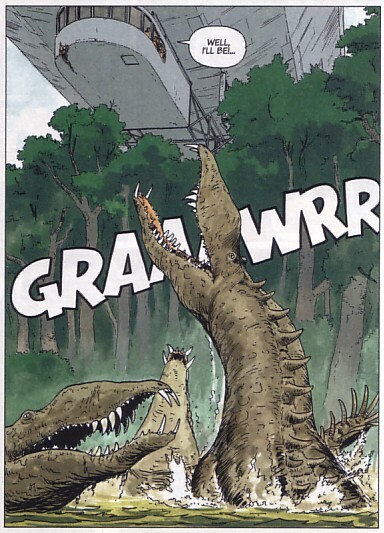 Lots of splash pages and fight scenes, with flying, action, monsters, machinery and superhero posing. I plan to publish it as a black and white comic, to keep it affordable to the kids." Kev's a regular face on TV spots about comics - his appearances include The One Show, among others. His next media spot is a webchat for BBC Northern Ireland next week (Friday 3rd June), answering questions about comics: more information here at www.bbc. co.uk/northernireland/arts/ live/ . • If you are interested in drawing this comic, send a link to some online samples to Kev at kevf.sutherlandATvirgin.net. Please note - don't email him art as attachments. The Worlds of Aldebaran series, written illustrated and coloured by Leo (Luiz Eduardo de Oliveira), continues on from the original Aldebaran arc with the five album sequence of Betelgeuse published over four books by Cinebook. With the narrator character of the previous Aldebaran books, Mark Sorenson, sidelined on Earth, the Betelgeuse books use his lover Kim Keller as its main character. Set some six years after the final book of the Aldebaran sequence, Kim is now a trained biologist in her own right and a daughter figure to the much older and childless Alexa Romanova. As a leading figure in the Mantris group, Alexa is able to use her influence to get Kim on the expedition that sets off to investigate the disappearance of a recent colony ship from Earth to the planet Betelgeuse 6. There the expedition discovers the abandoned colony ship in orbit with most of its colonists dead and the surviving crew, who are living on the surface of the planet, split into two opposing groups. The larger group, dominated by the military, has set up their small colony in a lush river canyon while the smaller group dominated by the scientists is living on the desert-like canyon rim. From there they study the Iums which appear to be the most intelligent of the planet's indigenous creatures. Named by the colonists for the noise they make, the Iums are a cross between a panda and a gorilla with no mouth and a biological "battery" in place of a stomach. Without a mouth they have no speech and therefore the two groups of colonists are divided as to whether they represent a sentient species or are just an intelligent animal. This division takes on a greater importance as under Earth law planets already inhabited by sentient species cannot be colonised however a vast amount of money has already been invested in the Betelgeuse colony for it to fail due to the disputed possibility of sentience in the Iums. Realising that her word may be the deciding factor in the decision as to colonise the planet or not once they are all rescued, Kim leads an expedition made up of people from both colonist groups into the depths of the canyon to try and determine once and for all just how intelligent the Iums are. As the expedition ventures further through the canyon than has previously been explored, the humans face more and more bizarre and dangerous creatures before Kim begins to realise that there may be a link between the two planets of Aldebaran 4 and Betelgeuse 6. Leo builds on the universe and characters he created for the Aldebaran arc and continues their stories on a new planet with seemingly new problems. However the basic setup of the factions is remarkably similar to the previous books with a male totalitarian military regime dominating women on the one side and a rebel grouping opposing them on the other. Where the Aldebaran plot jumped somewhat between the second and third albums, the Betelgeuse plot is smoother over the five albums and while it doesn't take the years of the previous books it does take place over months although it does have some rather convenient coincidences as the characters discover more about the planet and its inhabitants. Unlike on the fairly lo-tech Aldebaran, the human colonists of Betelgeuse have more hi-tech gadgets to help them and, while the spaceships are well designed, the aerojeep does rather look like it was built by Volkswagen while the aerobike is basically a large Sinclair C5. However, as in the Aldebaran books, it is with the flora and fauna of Betelgeuse 6 that Leo's imagination and artwork shine. His concepts and designs of his alien creatures and their surroundings are unique and fascinating. While the Iums are either friendly or hostile depending on which group of colonists they are dealing with, the majority of the rest of the creatures that the books feature tend to be hostile for one reason or another. The plot leaves the reader wondering just how intelligent the Iums really are until far into the books when Leo takes a big and unexpected side step to explain just what is happening on the planet before he returns to the main story. This twist will, no doubt, be returned to in future books but it felt contrived when it happened and is one of a series of issues with the books that include the repetition of the motivations of the human factions, the coincidences that keep the plot ticking over, and the most blatant censorship of any of Cinebook's titles as they strive to retain the female characters' modesty in the hot and sticky environs of the canyon. Yet despite these issues, I read the five Betelgeuse albums back to back not because I had to but because I wanted to. Leo's imagination gripped me and I wanted to know just what made this world and its creatures tick and that overrode any other issues I had with these books and left me looking forward to the beginning of the next part of the story in the Antares sequence of titles. The Worlds Of Aldebaran books were originally published by Cinebook as two French albums per English book before being standardised to the current one album per book, with the first Betelgeuse album being published in the third Aldebaran book before the Cinebook series changed titles. The following is a listing of which French albums appear in which English books. • Details of all the Cinebook versions of the Aldebaran and Betelgeuse books are on the Cinebook website. • There are more details of all the original albums (in French) on the official Worlds of Aldebaran website. Renowned comic book artist Frank Quitely will be joining the hundreds of top comic artists and writers assembling at MCM Expo’s famous Comic Village this weekend. Best known for his collaborations with Grant Morrison on titles such as New X-Men, WE3, All-Star Superman and Batman and Robin as well as his work with Mark Millar on The Authority, Quitely will be attending the show on Saturday to meet fans and sign autographs. The Expo has also announced that two more top comic creators, David Hine and Rufus Dayglo, will be at the London Comic Con on Sunday. 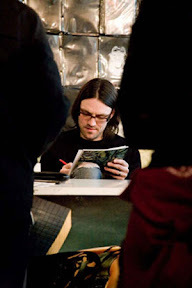 David Hine is best known as a writer on Marvel titles such as X-Men: The 198, Civil War: X-Men and Silent War, while he also worked on manga series Poison Candy and the Two-Face issue of DC’s Joker's Asylum. Currently working alongside Alan Martin as the main artist on the Tank Girl series, Rufus Dayglo draws for 2000 AD and Titan Books in the UK as well as IDW Publishing and Image Comics in the United States. • The downthetubes review of the MCM Expo held in May 2010 is here. 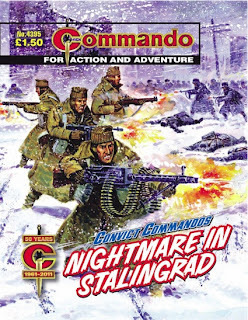 Here's the latest Commando titles now on sale in all good newsagents, featuring the work of creators such as Alan Hebden, Ian Kennedy and Ferg Handley. 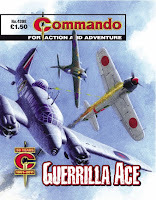 Commando has a new Facebook page and they're running a poll to find your favourite team from the comic. It's a showdown between the Headline Heroes, Convict Commandos and Ramsey's Raiders - who will you choose? Karl Braun - a German fighter pilot who hates the Nazi regime - deserts and stows away on a ship to the Far East. When he gets to the Philippines, though, war has followed him and he finds himself a prisoner at a small jungle airstrip. "It’s strange," says Calum Laird, Commando Editor. 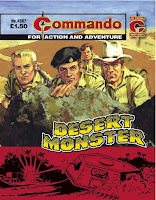 "I remembered this story very clearly from 40-odd years ago yet it wasn’t until I read it again for its re-issue that it struck me that whoever came up with the idea for the A-Team had been beaten to the punch by decades. Not only do we have the mechanical wizards, we even have a cigar-smoking hero! 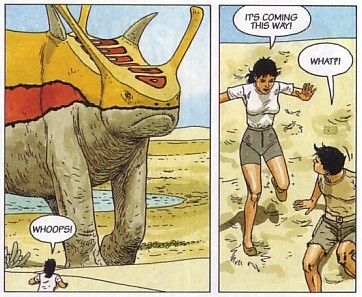 "At the age of 11, the creation of The Thing — the Desert Monster — fired my imagination so much that I tried to build a model of one myself. Of course I didn’t manage but that just made the heroes so much the better. "So, I challenge you have a look at this one and tell me that Lars, Alf, Jack and Tex — created and given form by Messrs Skentleberry and Quesada — aren’t better that their modern counterparts. The A*-Team, that’s them!" "Commando heroes have had their share of charms and mascots through the decades and, at first glance, this story seems to be about English pilot Ben Larrigan’s lucky gold pocket-watch and whether it’ll see him safely through the war," notes Scott Montgomery, the title's Deputy Editor. "However, a truck-full of cowardly Italian soldiers, desperate to surrender, are the real stars - especially Gino Coppa, the hyperactive sergeant who refers to himself in the third person and unexpectedly bursts into song with his chums every now and then. He’s a marvellous creation, appearing in a memorable desert adventure. 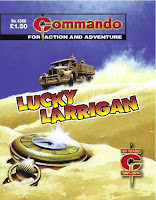 "We’re lucky that the Commando vaults are full of such gems and I’m lucky to have had the chance to select and share this brilliant tale with you 30 years on." • Vote for your favourite bunch of Commando Heroes on the title's Facebook page: Headline Heroes, Convict Commandos or Ramsey’s Raiders? The cream of the world’s comic talent will touch down in Derry/Londonderry next week for 2D, the Northern Ireland Comics Festival. The free event – hosted annually by the Verbal Arts Centre – runs from 2nd - 4th June and is the biggest of its kind in Northern Ireland as well as being a unique and engaging celebration of comic book culture. It marks the fifth time the event has run in the city and organisers have pulled out all the stops to ensure that this year’s event is the biggest and best to date, having secured some of the biggest and most respected names in the comics industry for this year’s programme. Guests include legendary artists such as Mick McMahon (Judge Dredd), Glenn Fabry (Preacher, Slaine) and Mike Collins (Doctor Who, Superman) as well as host of other comic creators who have worked on properties and titles such as Transformers, Batman, Star Wars, Spider-Man, Gorillaz, Game of Thrones and The Beano. One of the highlights of the festival is the 2D Comics Fair on Sat 4th June and those attending can buy comics, meet top comic creators, get free sketches of their favourite character, have a Robot version of themselves drawn at the ‘Hi Robot’ booth, or get their face painted as a fun character. Attendees can also enter in the Mario Bros and Moshi Monsters drawing competitions, the Fancy Dress competition or have a go on our ‘Robot Drawing Wall’, with great comic prizes for the best efforts. Festival goers can also have their photo taken with the Star Wars Stormtroopers, as the fantastic Emerald Garrison will be in attendance. This year one of the most influential men in Comics, Mark Chiarello (DC Comics VP Art Direction), will be attending to give an insight into the industry and host a series of portfolio reviews for aspiring creators, where he’ll be looking out for new talent. These portfolio reviews are notoriously hard to arrange, so please get in touch if you would like to take advantage of this great opportunity to get your skills noticed and possibly get a foot in the door of the comics industry. The festival caters for all ages with workshops and fun drawing events for all the family during the daytime and panel talks in Sandinos bar for the older audience on Friday 3rd and Saturday 4th June evenings from 6.30pm. Aldebaran: The Catastrophe published by Cinebook was one of the very first reviews that I did on downthetubes some two years ago. It published the first two French albums of the Aldebaran segment of The Worlds Of Aldebaran series in English for the first time. Since then Cinebook have completed both the five album Aldebaran arc as well as the five album Betelgeuse arc and will begin to publish the third arc, Antares, beginning in October 2011. Written, illustrated and coloured by the Leo (Luiz Eduardo de Oliveira) these series are set on human colony worlds in the 22nd century and follow the experiences of the colonists as they come to terms with the other life forms that inhabit those planets. The story of Aldebaran is told through the eyes of teenage fisherman Mark Sorensen who, along with Kim Keller, the younger sister of a friend, is orphaned when his village is freakishly destroyed, a destruction the pair are lead to believe was caused by a dangerous and previously unknown sea creature. 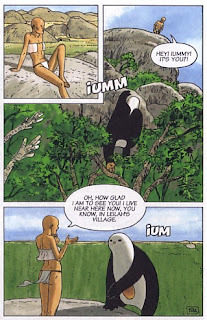 Helped and/or hindered by the journalist Gwen Lopes, biologist Driss Shediac, escaped prisoner Alexa Komarova and the scheming Mr Pad, Mark and Kim travel along the coast from their small outlying fishing village towards the planet's capital city Anatolia where they hope to find work and a new life. Instead they run foul of the authorities and end up imprisoned. The Catastrophe ends here after a long and fantastical journey for the two companions. The Group begins three years later with Mark in prison and Kim older and rather more streetwise and less impetuous than her younger self. The story takes something of a twist here as we discover just how strict the planet's authorities are and just about every character that survived the previous book makes a reappearance as Mark escapes from prison and he and Kim go on the run, abetted by the now disillusioned journalist Gwen, as everyone tries to discover where and just who Alexa and Driss are and how they seem to know so much about the sea creature that destroyed Mark and Kim's village. The Creature brings the saga of Aldebaran to a conclusion and the reader discovers much more about the creature as Mark and Kim's group vie with the authorities to understand the sea creature and discover the reason that Aldebaran has been cut off from Earth for a century. Leo weaves a story that initially seems to be setting off in one direction but which takes a twist amost halfway through that raises the interest level considerably. What begins as a simple quest storyline for the truth about the sea creature also becomes a rebellion against the state. These are thoughtful books covering the themes of coexistence with nature, totalitarianism and, to a lesser extent, sexism. Indeed as Leo grew up under a military dictatorship in Brazil, a country with an enormous coastline as well as the huge Amazon river basin, and considerably more wilderness than civilisation, you can see where the ideas and themes of his Aldebaran story come from. Indeed the books often feature long sections of discussion between the characters as they argue out these themes amongst themselves. Yet for all the slower talky sections it is all held together by Leo's remarkable alien flora and fauna. From the enormous but docile flying Caravelle to the dangerous but immobile Eleuter, from the beautiful Gregorias (below) to the startling Amedea, the creatures and the environments that they inhabit are truly remarkable and the reader is often left both fascinated and repulsed by them. If you are after fast moving, shot-em-up SF then try Cinebook's Orbital since the Aldebaran books will not be for you. However for a thoughtful if, at times, perplexing and talky story set in a gloriously alien world then Aldebaran is both a planet and a series worth sticking with and exploring to the end. Just remember that with this series, determination pays dividends.